The forecast high for Monday is 105 degrees and area agencies are already sending out warnings about how it will impact transit and power. Before 10 a.m., The T sent out an alert to riders saying that trains will be operating at reduced speeds due to excessive heat. Riders are to expect delays of 10-20 minutes Monday afternoon. ERCOT, who manages the flow of electric power to much of the state, is under normal operating conditions on Monday -- though conservation is encouraged. A heat advisory is in effect for Monday and Tuesday for nearly all of North Texas until 8 p.m. Read the latest forecast from NBC 5's Samantha Davies here, or watch in the video above. So far this summer, we have had 14 days of temperatures in the triple-digits with four of those days over 105 degrees. At the same time during last year's oppressive stretch of hot days, which included 35 days over 100 degrees, only three of those days had climbed to 105 degrees. The annual average number of 100 degree days is 18. 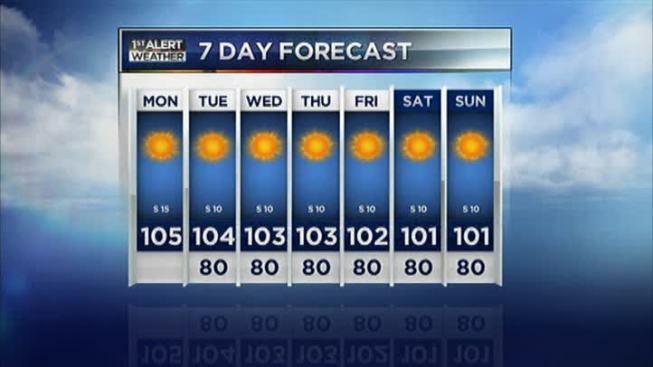 The forecast highs for the remainder of the week are all above 100 degrees, including a high of 104 on Tuesday and 103 on Wednesday and Thursday.